Willie Doherty‘s new video installation SEGURA at Manifesta 8 in Murcia, Spain until 9 January 2011. Richard Grayson solo show The Golden Space City of God at Kunstmuseum des Kantons Thurgau, Switzerland until 30 April 2011. Nathaniel Mellors’ Ourhouse at the British Art Show-7 In the Days of the Comet at Nottingham Contemporary until 9 January 2011. The next exhibition at Matt’s Gallery will be Slow Action by Ben Rivers. The exhibition will run from 26 January-20 March 2011. Slow Action is a post-apocalyptic science fiction film that brings together a series of four 16mm works existing somewhere between documentary, ethnographic study and fiction. 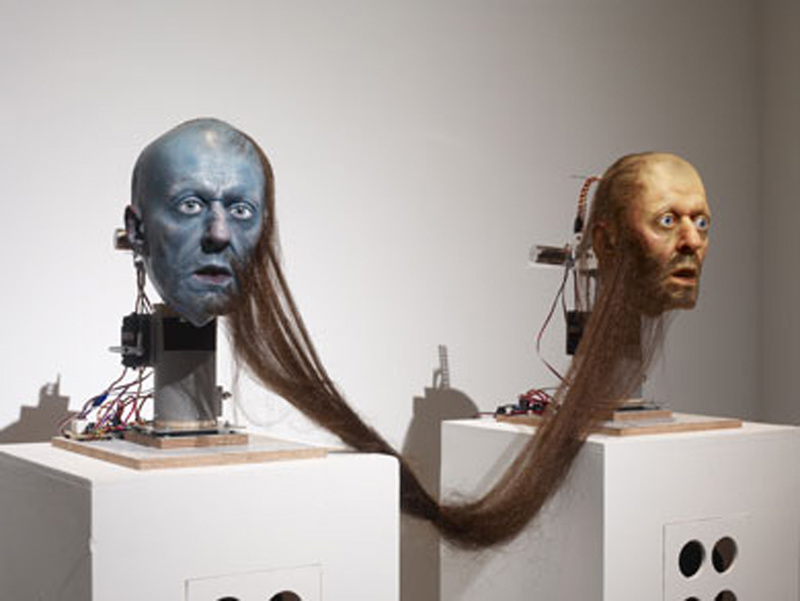 Lindsay Seers and Ben Rivers are recipients of 2010 Paul Hamlyn Awards for Artists. Paul Hamlyn Foundation Awards are made at a critical point in an artist’s career and recognise talent, promise, need and achievement. Mike Nelson returns to Camden Arts Centre to recreate his seminal work Studio Apparatus for Camden Arts Centre – An Introduction; a lexicon of phenomena and information association; futurobjectics (in three sections); mysterious island*, or Temporary Monument, (1998/2010) originally created during his residency there in 1998. The completed work can be seen in Never The Same River (Possible Futures, Probable Pasts), curated by Simon Starling from 16 December 2010 -20 February 2011. Willie Doherty will be showing Non-Specific Threat, 2004, and Jordan Baseman Cactasia! 2003, in the group exhibition Moving Portraits at De La Warr Pavilion from 31 January to 31 March 2011. The exhibition explores the past sixty years of portraits in moving image by significant international artists practising in the field of film and video technology. The works in this exhibition are all experimental during their time and include well-known sitters and subjects as well as more personal portraits of friends and family. Baseman’s work Cactasia! 2003 will be shown in the exhibition Coming of Age at The Great North Museum, Newcastle University from 12 January-2 March 2011. Jordan Baseman’s work Nasty Piece of Stuff, 2009 has been awarded Best Film in the Dangerous Experiments category at the Los Angeles Animation Festival International. The Festival ran from 3-7 December 2010. A solo exhibition of Baseman’s work entitled Nasty Piece of Stuff will be presented at Aberdeen Art Gallery, Aberdeen from 27 January-24 February 2011. Richard Grayson is showing The Golden Space City of God in a solo show at the Kunstmuseum des Kantons Thurgau, Switzerland. 24 October 2010 – 27 March 2011. Lindsay Seers has recently been awarded an Arts Council England grant towards the creation of a new work It has to be this way3. Seers will be travelling to Tasmania in December to start filming this new work. Seers will also be undertaking a residency in Tasmania in December as part of an annually commissioned visual art exhibition for 2011. The exhibition, entitled Dis-covery, will feature artwork exploring issues associated with three themes: island life, artistic romanticism and romantic ideas of islands and island culture. Eleven artists have been invited to participate. Best Laid Plans, 2010 (book cover) published by The Drawing Room to accompany the exhibition of the same name showing until 23 January 2011. I Can Travel Far From Here by Paul Rooney is currently showing as part of Best Laid Plans at The Drawing Room, until 23 January 2011. The work consists of a thirteen point plan that involves using toy tanks to save the world from Jesus. A prelude to Nathaniel Mellors‘ exhibition at ICA in March 2011, Mellors will be taking part in a panel discussion The Trouble with Sculpture alongside Sacha Craddock, Haroon Mirza, Martina Schmücker and Keith Wilson at the ICA on 19 January 2011. The Trouble with Sculpture is a ticketed event, please contact the ICA for booking information. Anne Bean‘s Autobituary: Shadow deeds (originally commissioned by Matt’s Gallery in 2006) and PAVES, will be shown as part of The Life of the Mind: Love, Sorrow and Obsession at The New Art Gallery Walsall, 21 January-20 March 2011. Melanie Jackson, The Urpflanze 1, 2010 (installation view at The Drawing Room, 2010). The Urpflanze (1.1) can be seen at The Art Exchange until 18 December 2010. Melanie Jackson’s The Urpflanze (1.1) traces links between the economy, science, aesthetics and plant forms, taking a lead from Goethe’s notion of the Urpflanze, to articulate how botanical morphology enters and affects the imagination. The Urpflanze (1.1) is an extension of The Urpflanze 1 originally shown at The Drawing Room, London. It can be seen at The Art Exchange, Essex University until 18 December 2010. Jimmie Durham is showing A Meteoric Fall to Heaven, 2000, and Jaroslaw Kozlowski Soft Protection: Russian Version, 2010, in the group exhibition The New Décor at Garage, Moscow. The New Décor is an international survey of over 30 contemporary artists from 22 countries who have created sculptures and installations which explore interior design as a means of engaging with changes in contemporary culture; transforming, subverting or recasting the appearance of objects we associate with the everyday into something uncanny, compelling and revealing. The New Décor runs until 6 February 2011. Willie Doherty is showing a new video installation titled SEGURA at Manifesta 8 which is taking place in Murcia, Spain from 9 October 2010-9 Jan 2011. Manifesta 8 is curated by an artistic team made up of three groups of curators, composed of Alexandria Contemporary Arts Forum (Egypt), Chamber of Public Secrets (Scandinavian countries, Italy, The U.K and Lebanon) and tranzit.org (Austria, Czech Republic, Hungary and Slovakia). Jordan Baseman has been commissioned by Animate Projects to make two films, Galaxy and Super-Whip, which can be seen online from 30 November 2010 as part of the Rough Machine commissions. Jordan Baseman has also been awarded a residency at St John’s College Oxford, which will commence in April 2011 and run for 10 weeks. Lindsay Seers is showing The Truth Was Always There in the exhibition Steps into the Arcane at the Kunstmuseum des Kantons Thurgau, Switzerland. The exhibition continues until 19 December 2010. Nathaniel Mellors is showing Ourhouse at the British Art Show 7 – In The Days of the Comet at Nottingham Contemporary from 23 October 2010-9 January 2011. The exhibition will then tour to London, Glasgow and Plymouth throughout 2011. Lindsay Seers is showing It has to be that way1.5 at aspex, Portsmouth from 23 October 2010 to 2 January 2011. It has to be this way¹ by Lindsay Seers is travelling to the Nikolaj Copenhagen Contemporary Art Center as part of the exhibition EFTERBILLEDER [Persistence of Vision], in association with FACT, Liverpool, where it was first shown in June 2010 under the title Persistence of Vision. The exhibition will continue until 30 January 2011. Imogen Stidworthy’s new installation The Work v.02, and By Ours. 53° 27′ 46.67″ N, 2° 59′ 10.35″ W will be shown at Kunstpavillon, Innsbruck in the exhibition The Work from 26 November 2010 to 10 January 2011. Imogen Stidworthy The Work exhibition at Kunstpavillon, Innsbruck from 26 November 2010 to 10 January 2011. Stidworthy’s film Barrabackslarrabang (2009-10) has been selected for this year’s Rencontres Internationales Paris/Berlin/Madrid which commences at Centre Pompidou, Palais de Tokyo and the Châtelet Theatre, Paris from 26 November to 4 December 2010. The British Council have announced that Mike Nelson has been selected to represent Britain at the 54th Venice Biennale. He will present a solo exhibition in the British Pavilion, which will run from June–November 2011. Mike Nelson’s The Coral Reef, originally commissioned by Matt’s Gallery in 2000, has been purchased by the Tate and will be exhibited at Tate Britain from 17 May 2010. Matt’s Gallery are currently searching for a full time General Manager to join the team. For further information regarding the position and application details please visit our jobs pages here. Clare Fitzpatrick, Gallery Manager (Projects) at Matt’s Gallery for the past four years, has decided to move onto pastures new. We wish Clare the best of luck with future endeavours and welcome back Holly Slingsby, who has worked previously at Matt’s Gallery as Stanley Picker Intern and Finance Administrator. Holly will be acting Gallery Manager (Projects) over the next few months. Matt’s Gallery have now welcomed our second Stanley Picker Intern of 2010. Sophie Cundale will be working at the gallery for six months. Sophie is an artist who rides a bike and likes boxing. She previously worked at Artangel and is a recent graduate from Central Saint Martins.